Getting my son, Joel, to eat more vegetables has been a challenge lately. He's gotten pickier with vegetables, limiting himself to only baby carrots, broccoli and fresh summer corn. Every now and then, he surprises me and helps himself to green beans... like this particular dish. This recipe really takes advantage of the fresh green beans of the season. 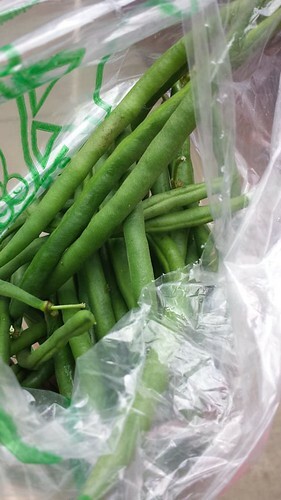 After a recent trip to the farmers market, I picked up some beans and came across a recipe from Food Network. 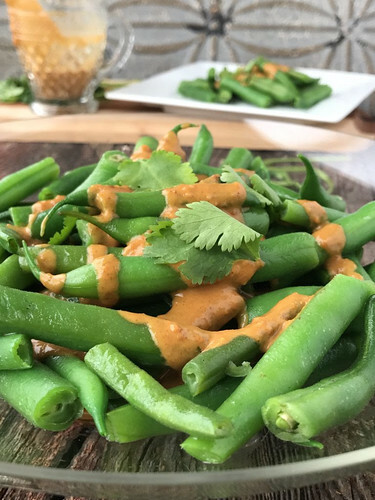 It really is all about the homemade satay sauce that dresses the beans before serving, but pairing it with fresh beans makes all the difference. You could easily prepare the same satay sauce and serve with steamed broccoli, cauliflower or even sugar snap peas. At this point, I'm happy to serve the satay sauce with any vegetable if it means Joel will eat it! We served this with steamed rice and grilled chicken for a healthy meal which was easy to make after a long day. You can even prepare the satay sauce in advance and warm up in the microwave too. If you or family members are allergic to peanuts, you can substitute the peanut butter for almond or cashew butter as well. In a large skillet set over medium heat, add olive oil. When oil is hot, add the trimmed green beans and cook until crisp-tender; transfer to serving platter. In a small bowl, whisk together peanut butter, soy sauce (or tamari if using), hot water, lemon juice (and sriracha if using). Whisk until smooth. 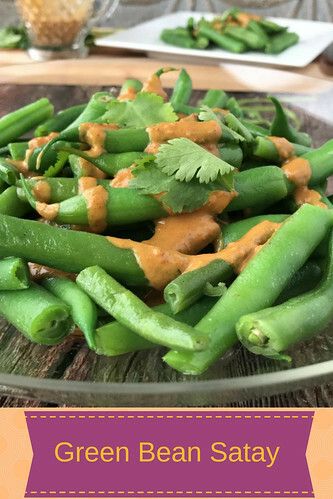 Drizzle peanut sauce over beans or serve on the side. Garnish with cilantro if desired.